To keep up-to-date with new add-ons, a few years back I started to active review them on this blog. Based on the reviews and on the experience of working with organisations using Moodle, I put together a list of “Essential plugins for Moodle”, which I have regularly updated and presented at conferences, including the recent Ireland & UK Moodlemoots and the iMoot in 2012. Michael de Raadt is the Development Manager at Moodle HQ and has been actively developing Moodle plugins over the past few years including Progress Bar and Unanswered Discussions. In 2010 Michael wrote the book “Moodle 1.9 Top Extensions Cookbook” which showed examples of how the plugins could be used in teaching. 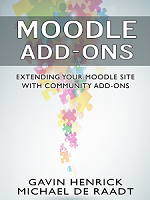 For the past year I have collaborated with Michael to write a book on Moodle add-ons and today we are delighted to announce that our book “Moodle Add-ons: Using add-ons to enhance your Moodle site” is now available to buy. Our new book goes beyond the work we have done before, extending the presentations and reviews into a new context, providing more reasoned background about add-ons, their format and function, and on the process of evaluation. The Moodle Add-ons Kindle edition is available from Amazon for about 9.99 dollars depending where you are. The Moodle Add-ons ePub edition is available from Apple iTunes for about 9.99 dollars depending where you are. The Moodle Add-ons paperback if available from Createspace or Amazon for approx 25 euro depending on where you are. The first three chapters explain Moodle add-ons in general, including the different types of add-on plugins available, how they are contributed and why people write an add-on. The book continues with a guide on how to install a Moodle environment to safely test add-ons, away from your production site, and explains how to install a sample add-on. Perhaps most valuable is the third chapter, which describes the many aspects an institution should consider before installing an add-on. Hope you have as much fun reading the book as we had writing it.